For a period of at least four-(4) months as a holder of the Senior Scout Membership Badge. Earn Safety and Citizenship in the Home merit badges. 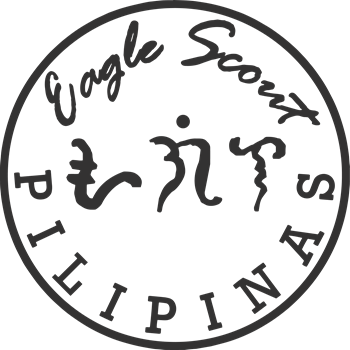 For a period of at least five-(5) months as a holder of the Explorer Scout Rank. Earn the Citizenship in the Community, Filipino Heritage , First Aid, and Ecology or Tree Farming. Earn Citizenship in the Nation, Physical Fitness , Weather Merit Badges. Land Scout specialization also earn the Swimming, and Soil and Water Conservation. Air Scout specialization also earn the Airplan Modelling and Electricity. Sea Scout specialization also earn the Survival Swimming and Boating. For a period of at least seven-(7) months as a holder of the Outdoorsman, Airman, Seaman Scout Rank. Earn one-(1) Specialist Rating (involving three related merit badges). Land Scout earn the Scout Conservationist. Air Scout earn the Scout Airman. Earn the Camping and Emergency Preparedness Merit Badges. For a period of at least eight-(8) months as a holder of the Venturer Scout Rank. Within your chosen area of vocational/avocational study, earn a second Specialist Rating (involving three related merit badges). INFORMATION ABOUT THE REQUIREMENTS ARE EXCERPTS FROM MERIT BADGE CENTER PHILIPPINES.